← What is the purpose of my life? 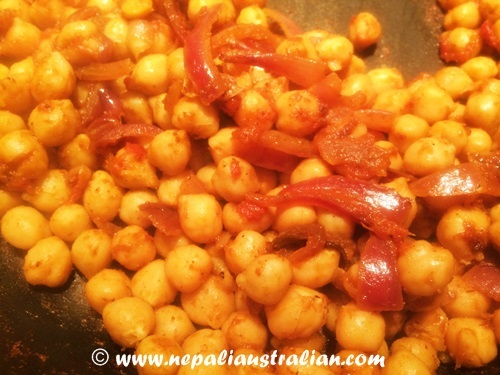 “Chana” means chickpeas in Nepali. It is one of the easiest, healthiest and tastiest recipes that I loved to make occasionally. It goes well with rice or roti. 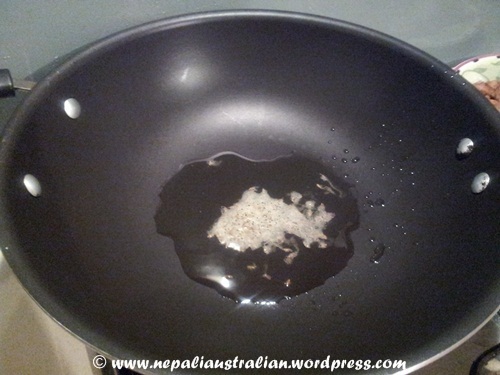 In a wok, heat the oil; add turmeric powder and bay leaves. 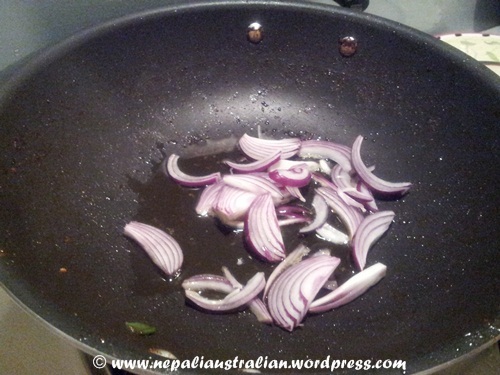 Add the sliced onions and fry for 15 minutes or until golden brown, stirring regularly. Add all the other spices, garlic ginger paste and fry some more. 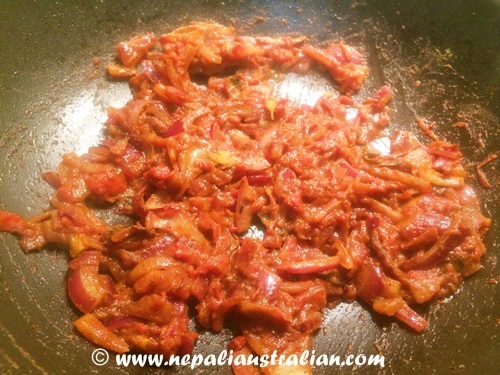 Once onion is cooked, pour diced tomato and let it cook for 5 minutes stirring occasionally. Mix well and add the chickpeas and fry for few minutes. Add the chicken stock and Bring to a boil then reduce the heat, cover and simmer for 5 minutes, or until most of the stock dries out. Garnish the chick peas with fresh coriander. Delicious curry is ready and it can be served with rice or roti. 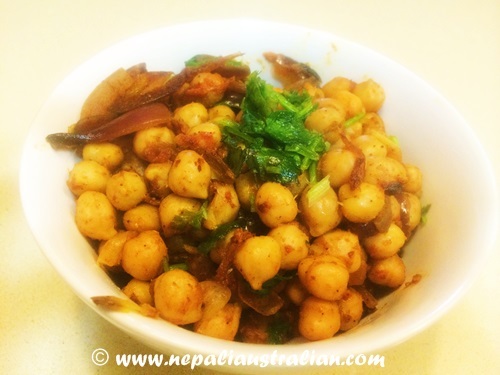 This entry was posted in Foodie, Recipe and tagged australian, chickpeas, easy recipe, M from nepaliaustralian, nepali australian, Nepali blog, nepali recipe, Nepaliaustralian, quick recipe. Bookmark the permalink. I was always fairly thin, but found out that I could retain too much water while pregnant if I ate too much salt. I was surprised (this was almost 30 years ago) when I found out teriyaki sauce and soy sauce has so much sodium. I like this curry recipe since it has only what salt you choose and the spices you have are very good for you. You may as you get farther along, need to worry about baby pushing into your tummy, then I had to cut spicy food or would get acid reflux! (I never took any medicines except one tylenol for headache or tums for my stomach. I tried to nibble on mint or spearmint and drank green tea. I had one bad night of acid reflux that I vomited but so far rest has been fine. Hope it will stay like that. Have you had any morning sickness yet? I loved spicy foods until I was pregnant, then it was green tea and mild flavors… Hugs for you, hubby and little one, too! I am happy to say that I didn’t have any morning sickness at all. So far I am eating normal food and loving spicy food . Thank you for so much love Robin. I am glad you don’t have any morning sickness and I do hope you can continue to eat your favorite foods dear. You are always welcome for my hugs and love, far distance, your ‘grand auntie,’ Robin ha ha! Thank you so much Robin.Hugs Hugs Hugs..